I’m supposed to return her to Tristan to finish the deal. But now I’m dreading the day when I have to drop her off. Can I really do it? I’m not supposed to care about this woman. I’m not supposed to care about anyone, actually. But I care about Bellissimo. Warning: My review may contain spoilers!! 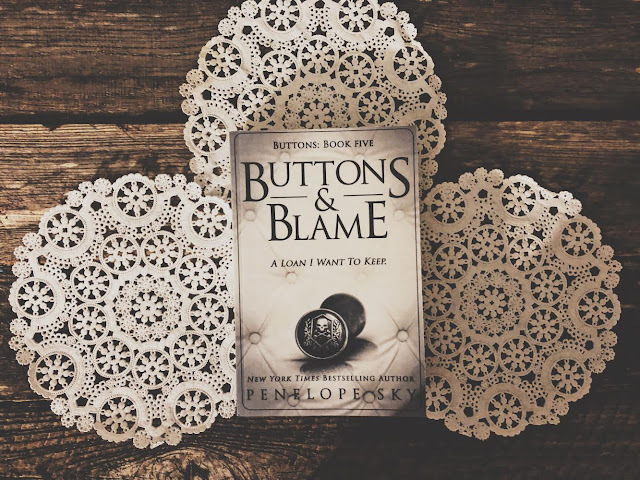 Buttons and Blame continues where Buttons and Shame left off. I love how these books mesh together. There is no time gap in between books. It’s just bam bam bam. Almost like one book separated into six. I really love that there are no time gaps. Thank you Penelope for not leaving blank time spaces. In this book, Cane is falling for Adelina. He refuses to show it and he refuses to acknowledge it. He still plans on giving her back to Tristan, equipped with the cyanide pills. I love watching their relationship blossom. It’s beautiful that she can trust Cane after what Tristan and his goons have done to her. What I don’t love, which I’m sure everyone else does, is Crow and Pearl’s point of views. I loved the books about them. But this isn’t really about them anymore. We shouldn’t get their POVs anymore. Just Cane and Adelina’s. I do enjoy how their story is going, but these three books are supposed to be about Cane and Adelina. Why do we need four POVs? This book made up for the action we didn’t get in Buttons and Shame. We get to see Cane’s emotional turmoil over taking Adelina back to Tristan. We get to see him decide to get her back. We get to see the action. The kills. It’s amazing. We get that dark part of this romance. I do like that this book is left off with a cliff hanger. You’re literally at the very edge of the cliff with this one. Like, wtf. I need to know what happens ASAP. Luckily for me, I have the last book in this series and so I do not have to wait to find out. So many things happened in this book and I loved it. It was much better than Buttons and Shame. I have higher hopes for how this series will end now.